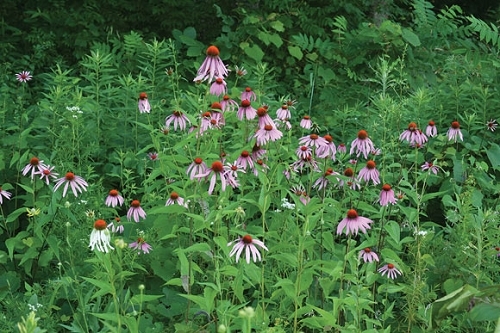 With its red to orange center and rose-purple outer petals (ray flowers), this is the most attractive Echinacea species in Missouri and the one most widely cultivated. 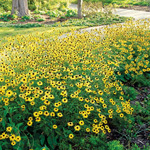 It grows well in light shade to full sun, and it needs average to moist soil. A single healthy plant can produce from 25 to 50 flower heads over the blooming period, which is usually four to eight weeks in June and July with some blooms into October. 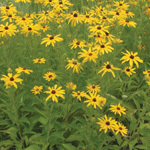 Purple coneflower is excellent for cut flowers. 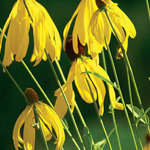 Songbirds love coneflower seed; deadhead the seed heads to prevent unwanted seedlings in flower beds. The yellow flowers of gray-head coneflower (Ratibida pinnata) make a nice contrast with purple coneflower. Seed: Check for ripe seeds to harvest June through September. Seed will likely germinate readily without stratification, but we recommend at least 2 to 4 weeks.